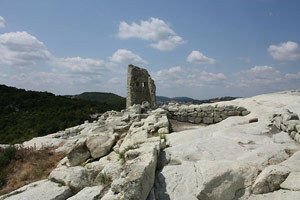 Perperikon is a great megalithic sanctuary, which forms one of the oldest and most historically important archeological complexes opened in the Bulgarian land. Quantity and type of evidence found proving that this place was located in the famous old shrine of Dionysus. On Perperikon is where it was believed that the relics were exposed to Orpheus or part thereof. The whole archaeological complex of Perperikon consists of four main parts of the Neolithic. The first is a massive wall, the second is the Acropolis, built of huge stone blocks, occupying the highest part of the hill. The third section of the Perperikon is the Palace, which was carved into the rocks and covering an area of 10, 000 sq. m. The complex is part of the northern and southern suburbs, which constitute a system of small streets in the rocks, buildings and temples. Perperikon is located on a high rocky peak at an altitude of 470 meters in the eastern part of the mountain. The archaeological complex is located 15 km northeast of the town of Kardjali. At the foot of Perperikon in the Upper Village remains a fortress situated very close to the Perperikon River, which flows into the nearby Lake, Cold well, built in the bed of the river Arda. Along the river, which forms the fertile and picturesque area around the archaeological sites are scattered from different eras that surround the actual center of Perperikon. The whole complex Perperikon occupies a total area of 12 sq. km. The sanctuary is included in the hundred tourists site of the Bulgarian Tourist Union. Excavations of Perperikon began in 2000 as work on the discovery led to new evidence and for this important archeological complex the work does not stop today. The ancient Eastern Rhodopes were an attractive place for populating and occasionally they are considered the cradle of megalithic culture. People in these places was long before the Thracians. 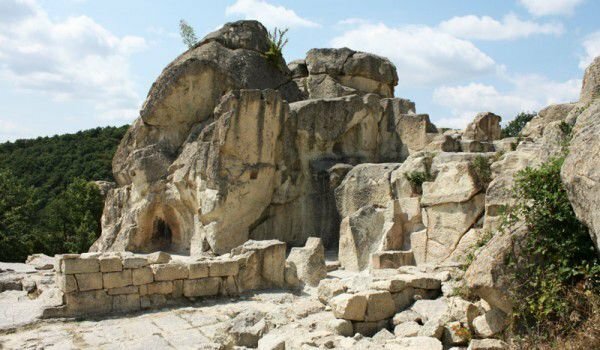 Current evidence indicates that Perperikon sanctuary of Dionysus was a Thracian tribe. Legend of the sanctuary of Dionysus tells how the son of Zeus and Semele was born among the other gods. Multiple suites satires of goat hooves and wonderful Menada, Dionysus wandered through the earth and taught people how to grow grapes and make wine. As a result, later appeared in his honor the holidays that are called Orphic mysteries that are only focused on single men. Rites and secret rituals occurred in closed societies and hidden places not accessible to the eyes of other people in rocks and caves. These places were in the Eastern Rhodopes and especially Perperikon which culminated the symbolic death of the king-priest, which is a reference to the dismemberment of Dionysus by the Titans, which were carried out with the sacrifice of a goat, horse or bull. Addition to this is the performance of the symbolic conception of the goddess-mother, who launches a new life, which, is a mass mating of males and females. Studies in recent years of Perperikon are adamant that this was a sanctuary of one of the most popular ancient characters - Orpheus, who was born somewhere in the confines of Thrace. According to Professor Nikolai Ovcharov of Perperikon there were exposed relics of Orpheus, or part thereof, as is known that Orpheus was disjointed. This had happened in the extraordinary high rocks and were buried in the ground instead. Furthermore Orpheus Perperikon is ritually buried with Rhesus who is a hero from the Trojan War. 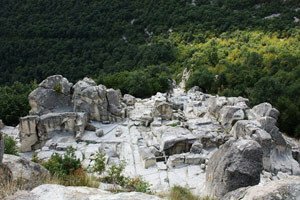 With the evidence discovered Perperikon becomes the first known world sanctuary of Orpheus. Here came the worship of people across East and the East Mediterranean basin. Evidence for this hypothesis included pottery and coins and many antlers which were used for ritual sacrifice.